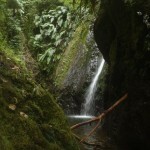 Waterfall tramping trip. Low volume, several 30-45m drops. 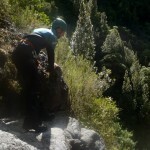 This canyon is fully described in the Canyoning in NZ guidebook. 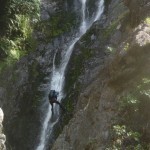 Below is a video from Tony Gazley, from a Wellington Tramping and Mountaineering Club trip to the canyon. 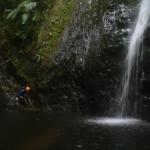 WTMC does a few canyoning trips in the area; get in touch with them to get involved. This entry was posted in 2 Star Canyons and tagged Lower North. Bookmark the permalink. 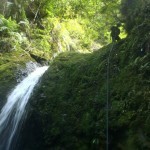 “We recently descended Eager Beaver (wairapapa) and placed twin bolts above each of the 3 big abseils. 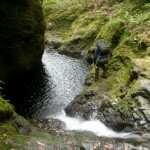 These reduce the risk of abseiling off rotten log jams over rock edges. 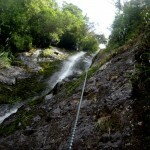 We found an abandoned rope on the last abseil trashed by the water. The abseiler had used a fishermans knot, which always jams on edges, and then failed to move the knot past the edge! 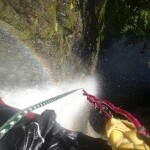 Our new bolts take the rope just out of the flows reducing the hazard of high water decent and smoother pull throughs. Hit this canyon up just before winter, it was absolutely Adrenalin pumping. I’ve done a lot of caving and climbing but this was the first canyon. No problems finding it with the instructions, actually entered into the top stream further up and had another 7-8 m abseil. All the log anchors were still in place, look pretty sketchy but there solid. 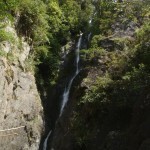 Took a bit longer than expected and it got dark at the top of the second major waterfall, and then on the last major abseil our ropes got stuck (50m 9ml dynamic and 50m 11ml static) the ropes were probably crossed but the two of us couldn’t pull it down and it was pitch black by this point and we couldn’t see what was going on even with head torches.n knowing we had a few shorter abseils left we had no choice but to pull as much rope down as possible and cut them (very, very soul crushing/tears in my eyes) thankfully we got just enough to get out of the canyon get back to the cabin and enjoy a few brews. You really do need alot of sling we sacrificed 5.
all in all was an awesome day and we will be back in there after winter to do it again maybe with some footage this time.